Editor's note: The Florida Conference welcomed several new staff members in July. Florida Conference Connection will take a closer look at their backgrounds and ministry plans with profile stories over the next few weeks. LAKELAND – It’s a new office, new direction, new duties – but for Rev. Dr. Sharon Austin, all that newness is kind of old hat. In her 33 years of ministry, Austin has blazed a trail as first African-American and/or first female pastor at several churches in Florida and Georgia and recently completed five years as South Central District superintendent. People who know her say she’s a natural to take on the role of Connectional Ministries director, a newly expanded position with oversight of church development and vitality, camps and campus ministries, communications and the newly formed Missional Engagement office at the Florida Conference. Asked how she was settling in after little more than three months on the job, she chuckled. “My response to that usually is a little bit of a laugh at first,” Austin said. That doesn’t mean she hasn’t been intently working on it, though. Meetings and phone calls have filled her calendar since she moved into an office in the Florida United Methodist Center in July, and she said it’s not unusual for her to leave work with only two or three cars left in the parking lot. Austin compared her job to that of a general practitioner in the medical field. Sometimes she’s not sure, either, Austin said, though she makes every effort to address each question or concern. Generally, she sees her job as requiring a shift in emphasis from management of day-to-day operations to “leadership with passion,” and it will take a willingness to ask appropriate questions and measure the effectiveness of the many ministries under her supervision. “I really want to bless people to live into all their gifts and graces and live outside the box,” Austin said. She sees her primary role as that of convening the members of departments throughout the conference, as well as partner organizations, and helping them mesh their missions to meet the challenges facing The United Methodist Church, including declining membership and failure to appeal to younger generations. “Conversation between offices is not intended to be linear. It is more intended to be three-dimensional,” Austin said. Collaboration often leads to outcomes that never would have been achieved in one department alone, Austin said. Although it may mean more people to consult with and thus more work, Austin said her colleagues so far have embraced the idea. Bishop Ken Carter, left, stands with James Salley of Africa University and Rev. 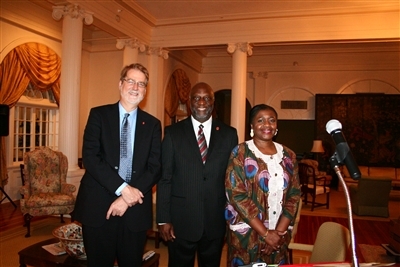 Dr. Sharon Austin, whose staff put together a dinner launch of the Florida Conference Africa University Initiative at Florida Southern College in September 2013. Photo by Rev. Armando Rodriguez Jr. Throughout her ministerial career, Austin has been a champion of interfaith efforts and inclusivity of people from all ethnic backgrounds and walks of life. She was the first woman ordained in the 95-year history of Ebenezer Baptist Church in Atlanta, home church and former pastorate of slain civil rights leader Martin Luther King Jr. She also was the first woman staff member there. She joined the Florida Conference in 1997 and became the first woman and African-American to serve three congregations: Faith in Miami, First UMC in Riverview and Cason in Delray Beach, where she was co-president of the local interfaith clergy association and a member of the Mayor’s Task Force on Race and Religions. In the conference, her leadership roles have included serving on Tampa and Atlantic Central District vision and transformation teams, on the Board of Ordained Ministry and in the Preaching Institute. As South Central District superintendent, she oversaw 84 churches. Among people she worked closely with was Rev. Jamie Westlake, senior pastor at First UMC, Brandon, and District Leadership Council chairperson. Westlake said the council faced a number of tough decisions during Austin’s tenure in South Central. He commended Austin’s patience and insistence on hearing everyone’s viewpoint but noted that she also insists on focusing on the mission at hand. “She’s tough as nails but filled with grace." Rev. 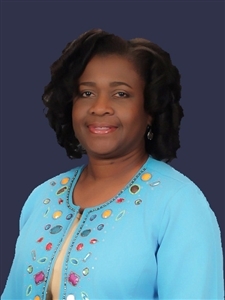 Dr. Joreatha Capers, senior pastor at Ebenezer UMC, Miami, said she first met Austin when Capers was a student at Gammon Theological Seminary in Atlanta. Austin’s leadership already was well known in the religious community at that time. “I had heard a lot about her dynamic preaching and [how she was a] wonderful example of a woman in ministry,” Capers said. After Capers’ graduation and ordination, the two crossed paths from time to time while in service on various boards and committees, including Capers’ chairmanship of the Florida Caucus of Black Methodists for Church Renewal. “She [Austin] is one who is able to look at the big picture, and she is able to talk on different levels,” Capers said. Austin and her husband, Michael, have been married for 36 years and have four children, Desiree, Genise, Erin and Nicholas.